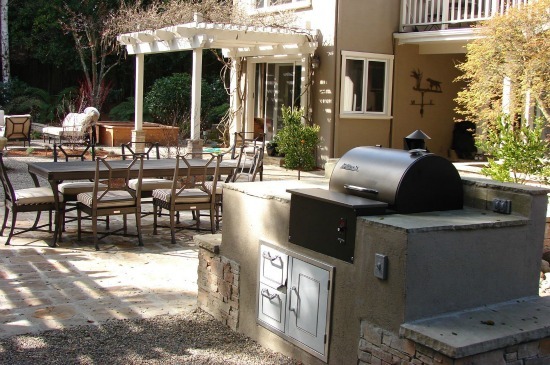 An outdoor kitchen can be an extension of your home that serves as a separate space for entertaining, enjoying, and relaxing in the glory of nature. One of these external rooms can be as simple as a temporary cooking and dining area, which is packed away in inclement weather. Or it can be a permanent installation equipped with an infrared grill, major appliances, a wood-fired oven, and gas and electric hook-ups. You may want to opt for something between these two extremes depending on your garden landscape design ideas, budget, and personal tastes. Whatever you choose, the easygoing style of dining al fresco invites family and guests to revel in the pleasures of the natural world while breaking bread together. Creating an outside cooking area increases your socializing options while raising your property’s overall appeal. Of course, these garden features depend on location. The ideal location is dictated by size of your yard, proximity of neighbors, as well as your desire for privacy. All of these factors are taken into consideration when we are creating your landscape design plan. For example, you may want your cooking and dining area right next to your home, which creates easy access and allows the space to be buffered from the weather by the walls of your home. On the other hand, a freestanding out door kitchen gives your greater range of design possibilities including greater options in layout, space, and overall look. You may also choose a stand-alone location to make use of a previously neglected or overlooked portion of your yard. Or you may also choose to simply add a grill island, which is a freestanding patio built with the same stone as your main patio. Whatever you choose, leisurely meals with family and friends are the gift expanding the space of your home to include an out-of-doors cooking area.